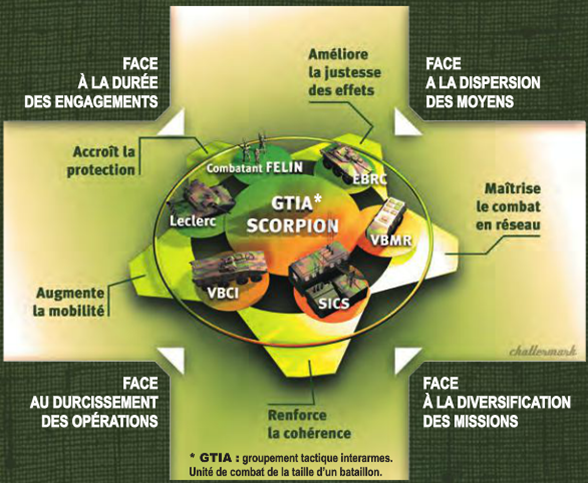 The Minister for Defence, Hervé Morin, launched the Scorpion program through a Ministerial Investment Committee (CMI). Scorpion (which stands for "Contact synergy reinforced by versatility and application of information") is an armament operation intended to structure the land forces for the next 30 years. Designed to place the latest technology at the disposal of soldiers, the aim of this ambitious programme is to adapt to new forms and the entire spectrum of modern combat, with threats different from the past. It also includes replacement of obsolete equipment (all versions of the VAB, AMX 10 RC and ERC 90 Sagaie) but also provides an immediate and secure tactical information exchange system intended to accelerate manoeuvres. Scorpion therefore represents a technological revolution which requires new thinking through new concepts such as collaborative combat. Many companies such as Thales, Nexter Systems and Renault Trucks Defense are actively involved in the program, in particular through the Joint Venture Group (GME), as is the case for production of the Griffon and Jaguar engines.